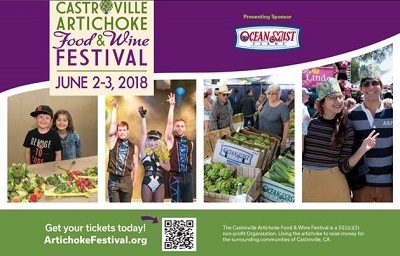 In June of this year, festivalgoers will gather again, this time to celebrate the 60th anniversary of what is now known as the Castroville Artichoke Food & Wine Festival, set for June 1-2, 2019, at the Monterey County Fair & Event Center in Monterey. The festival not only celebrates the artichoke with dozens of delicious artichoke dishes, a beer, wine and spirits garden, chef demos, live entertainment, a kids zone, field tours and more, but has also became a primary source of funding for local non-profit groups that depend upon a successful event for their viability. Open and free to all for both days of the Festival, Wild Science! by Imagination Gallery is hands-on fun with captivating STEM/STEAM displays and activities, for kids 1-101. Kids can take an excursion into the wild and amazing world of science through a plethora of interactive, fun, and visually captivating displays and activities. Families, adults, and children can experience the mysterious and entertaining aspects of science and technology in a fun and casual environment, through puzzles, hands-on displays, maker activities, and cool experiential demonstrations. The Festival also has a full schedule of fantastic entertainment in two separate venues, the Main Stage and Family Stage. Enjoy live music and performances for the whole family on the Family Stage. Listen to some of your favorite local bands and hot tribute bands on the Main Stage, along with a scholarship presentation, Marilyn Monroe lookalike contest, artichoke-eating contest and artichoke canasta (harvesting) contest. Bands performing on the Main Stage include the Chicano All Stars, Raise Your Glass tribute to Pink, Woodstock tribute to Jimi Hendrix, Maroon Vibes tribute to Maroon 5, and Purple Fox and the Heebie Jeebies. Entertainment is presented by KDON 102.5-FM. The Chicano All Stars Band is an extremely talented, dynamic and energetic all pro-musician band that plays Latin Rock, Rhythm & Blues, Old School and danceable Reggae. Lead vocalist Sam Martinez and lead guitarist and vocalist John Mallare, along with the polished horn section, create a sound that has made it one of the top Latin Rock bands in the area.T his dance band’s music appeals to a wide variety of audiences and will keep everyone dancing ‘til the music stops. Raise Your Glass (RYG) is quickly establishing itself as THE definitive Pink tribute show in the U.S. Based out of Los Angeles, CA, RYG has developed a growing fan base that includes a cross diversity of Pink aficionados as well as those who are captured by the group’s high-energy performances and quickly become Pink fans. Because of the multi-generational appeal and pop inclusiveness that defines Pink’s music, RYG brings a “Perfect Storm” trifecta to any event producer, high-end booking agent or corporate talent agency. Sometimes a stroll down Hollywood Boulevard is a step back in time. To 1969, to be exact. It’s that way when Anthony Aquarius plugs in his battery-powered amplifiers, straps his electric guitar on upside down and belts out “Hey Joe” to startled passersby. Aquarius sounds like Jimi Hendrix. He looks like him too — right down to the lanky gait, bushy hair and flamboyantly colored clothes. Hailing as Northern California’s Premier Maroon 5 Tribute Band, Maroon Vibes, will grace the ears of Artichoke Festival attendees. Playing a variety of Maroon 5 hits including “This Love”, “She Will Be Loved”, and “Moves Like Jagger”, Maroon Vibes will have you dancing and singing along for their entire set. Purple Fox and the Heebie Jeebies is a Fun, Funky, upbeat Reggae, Rockin’ and Rollin’ Band based in Silicon Valley. Their sophomore album “The Something of Love”, won the Tillywig and the NAPPA Award for 2018, and is currently up for the Grammy nomination for the Best Children’s Album. A celebration of kindness and sharing,the songs bring kids and grownups together, an uplifting, meaningful, dynamic album for an instant Perfect Day. Upbeat Reggae tunes with catchy melodies, nostalgic horns, funky bass and sweet guitar solos. For many years, the Artichoke Festival has been dedicated to informing and exciting festival attendees about the unique qualities of artichokes, including farming, harvest, and preparation to demonstrate how the artichoke industry has influenced the history of Monterey County. Now as a 501c3 organization, the purpose remains the same, with an emphasis on giving back to the local community. Proceeds from the festival are used to support 501c3 community organizations and activities that align with the festivals mission. California’s artichoke history began in 1922 when the first artichoke shoots were planted in Castroville. Today, more than nine decades later, nearly 100 percent of America’s fresh artichoke supply is grown in California and nearly two-thirds is grown in the small town of Castroville. Advance tickets and discounted ticket packages are available online for the 60th annual festival at artichokefestival.org. The It’s A Date package for 21 and older only, is $60, a savings of $20, includes two adult tickets and two wine and beer tasting tickets, good for Saturday or Sunday. This early bird discount also ends May 18, 2019, at 12 a.m. No refunds. In addition to live entertainment, there will also be live chef demonstrations. All chef demos will be held on the Chef Demo Stage at the festival and are free with admission to the festival. The Castroville Artichoke Food & Wine Festival began in 1959 and has since developed to become a harvest festival to celebrate the iconic artichoke and region known as the “Artichoke Center of the World.” The festival features family-fun events for all ages and has been a primary source of funding for local non-profit groups for many years. For more information, visit http://artichokefestival.org/. Seven Central Coast students will be awarded Ocean Mist Farms Academic Scholarships at 11:30 a.m. Saturday, June 2, at the 59th annual Castroville Artichoke Food & Wine Festival at the Monterey County Fair & Event Center in Monterey. Castroville, CA, May 17, 2018 — Seven Central Coast students will be awarded Ocean Mist Farms Academic Scholarships at 11:30 a.m. Saturday, June 2, at the 59th annual Castroville Artichoke Food & Wine Festival at the Monterey County Fair & Event Center in Monterey. This is the third year that the scholarships will be awarded. This year, 39 students applied for the scholarship. Each recipient will receive $1,000 at the awards ceremony June 2. The following are the scholarship winners, with name, high school, field of study and college they plan to attend, respectively. The mission of the awards are “to recognize students who demonstrate the guiding values of integrity, quality, passion and success in their daily decisions and in their pursuit of higher education.” Ocean Mist Farms’ 94-year legacy is represented in its strong belief in these guiding values. The Ocean Mist Farms Academic Scholarship Program awards a total of seven $1,000 academic scholarships each year to deserving students. Two $1,000 scholarships are available exclusively to a dependent of an Ocean Mist Farms Affiliate Company employee. Successful candidates demonstrate the use of the four guiding values in their daily decisions and in their pursuit of education. Applicants must be high school graduates with a 3.0 GPA or higher. Application requirements included an essay, letters of reference, a completed scholarship application and proof of higher education acceptance. The Ocean Mist Farms Scholarship Committee reviews all applications and awards scholarships based on the applicant’s demonstrated potential for academic success. The Castroville Artichoke Food & Wine Festival not only provides the community with a wealth of fun and learning every year, it gives back to the community through its dozen charity partners. Castroville, CA, April 13, 2018 — The Castroville Artichoke Food & Wine Festival not only provides the community with a wealth of fun and learning every year, it gives back to the community through its dozen charity partners. For almost six decades, the Artichoke Festival has been dedicated to informing and exciting festival attendees about the unique qualities of artichokes including farming, harvest, and preparation to demonstrate how the artichoke industry has influenced the history of Monterey County. And now, as a 501c3 organization, the purpose remains the same with an emphasis on giving back to the local community. Founded in 2008 by motorcyclist Rick Jenkins and members of the West Coast/Monterey Bay Harley Davidson Owner’s Group, Bikers for Bikes provides 20-30 new bicycles a year to underprivileged youth. The group is also involved in a Turkey Trot to raise funds and buy turkeys for holiday meals, donates toys to kids during Christmas and participates in other charitable events. This is their third year with the festival. To donate to Bikers for Bikes, contact Rick Jenkins at 831-320-2956. The Agricultural History Project (AHP) is a 501(c)(3) not-for-profit charitable organization founded in 1986, and opened its doors to the public in May 2004. Its mission is to honor and promote knowledge about agriculture on the Central California Coast, both past and present. It does this through exhibits and interactive activities that help visitors experience daily life on farms and ranches on the Central Coast during the 1800’s and early 1900’s. Peacock Acres in Salinas provides supportive housing, intense case management, and life coaching for foster children and young adults who have been separated from their families. With high character and resolve, Peacock Acres youth are steered towards opportunities for healing and growth as they continue their journey toward a fulfilling, productive life. The North County Bulldogs play in the 12-team Monterey Bay Youth Football League in Midgets, Pee Wee and Jr. Pee Wee divisions. The league’s mission is to provide a positive outlet for the youth around the Monterey Bay and tri-county areas. The league strives to teach kids the sport of football and cheer and how to be productive citizens who are proud of their teams and the MBYFL. The Castroville Artichoke Food & Wine Festival began in 1959 and has since developed to become a harvest festival to celebrate the iconic artichoke and region known as the “Artichoke Center of the World.” The festival features family-fun events for all ages and has been a primary source of funding for local non-profit groups for many years. Festival attendees enjoy several fresh artichoke food delicacies, a beer, wine and spirits garden, chef demos, live entertainment, field tours and more during the two-day festival. To support these events, the Artichoke Festival is encouraging individuals and organizations to volunteer their time to ensure another successful year. For more information about giving back to the community through volunteering, please visit http://artichokefestival.org/general-info/volunteers/. For general information, visit http://artichokefestival.org/. Castroville, CA, April 09, 2018 — Are you handy with needle and thread or sewing machine? Then you’re invited to join the Castroville Artichoke Food & Wine Festival Quilt Challenge, which will be awarding first, second and third-place People’s Choice prizes at the June 2-3 festival at the Monterey County Fair & Event Center. The theme is anything you want it to be, but your quilt must depict at least one artichoke on the front. Contestants must also use “some” of the fabric provided by the festival and can add as much other fabric as well as any embellishments. Quilts must be received by May 25, at The Artichoke Festival Office, 11402 Merritt St., Castroville, CA 95012. If interested in this contest, mail $5 to Castroville Artichoke Food & Wine Festival Quilt Challenge, 11402 Merritt St., Castroville, CA 95012, and you will receive the rules and fabric. Quilts can be viewed both Saturday, June 2 and Sunday, June 3, in the Salinas Room at the south end of the Monterey County Fair & Event Center, 2004 Fairground Road in Monterey. As the 59th annual Artichoke Food & Wine Festival approaches, the Castroville community is excited to come together to support the local community with entertainment and artichoke education this summer. For many years, the Artichoke Festival has been dedicated to informing and exciting festival attendees about the unique qualities of artichokes including farming, harvest, and preparation to demonstrate how the artichoke industry has influenced the history of Monterey County. Now as a 501c3 organization, the purpose remains the same with an emphasis on giving back to the local community. For more information about giving back to the community through volunteering, please visit http://artichokefestival.org/general-info/volunteers/. The Castroville Artichoke Food & Wine Festival began in 1959 and has since development to become a harvest festival to celebrate the iconic artichoke and region known as the “Artichoke Center of the World.” The festival features family-fun events for all ages and has been a primary source of funding for local non-profit groups for many years. For more information, visit http://artichokefestival.org/.